Malicious software, also known as malware, is any software that does harm to the system, such as a virus or spyware. You should be familiar with malicious software for the A+ Exams when seeking your CompTIA A+ Certification. A virus is a program that causes harm to your system. Typically, viruses are spread through emails and are included in attachments, such as word processing documents and spreadsheets. The virus can do any of a number of things: delete files from your system, modify the system configuration, or email all your contacts in your email software. To prevent viruses, install antivirus software and do not open any file attachments that arrive in your email inbox that you are not expecting. A Trojan virus is software that a user is typically tricked into running on the system; and when the software runs, it does something totally different than what the user expected it to do. For example, NetBus (an older attack) is an example of a Trojan horse program sent as a file called patch.exe. The user receiving the file, typically through an email, believes that the file will fix a security issue. The problem is that patch.exe is a Trojan horse, and when that horse starts running, it opens the computer up to allow a hacker to connect to the system. The hacker then uses a client program, like the one shown here, to connect to the system and start messing with the computer. The hacker can do things like launch other programs, flip your screen upside-down, eject your CD-ROM tray, watch your activity, and modify or delete files! 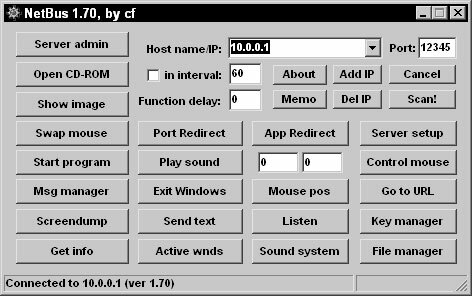 Using NetBus to control a user’s computer. A rootkit is malicious software installed on your system by the hacker that gives the hacker unauthorized access to the system at a later time. A worm is a virus that does not need to be activated by someone opening the file. The worm is self-replicating, meaning that it spreads itself from system to system, infecting each computer. To protect against a worm, you should install a firewall. A firewall is a piece of software or hardware that prevents someone from entering your system. A logic bomb is malicious software that could run every day, but the software was designed to wreak havoc on your system on a certain date and time. The scary thing about logic bombs is that they seem like useful software until the day the programmer decides it will become malicious! Spyware is a type of malicious software that when installed on your system, monitors your activity, including Internet activity. Adware is software that after being installed on your system, will pop up with ads promoting different products and websites. Be sure to install spyware protection and adware protection on your system to prevent such software from running on your computer. A term sometimes used by security professionals to describe software that performs unwanted actions is grayware. Grayware encompasses malicious software such as adware and spyware. Be sure to have malware protection software loaded on your system to protect against forms of grayware. Ransomeware is a type of malicious software that takes control of a system by having a window pop up onscreen letting you know that the system has been locked and that to unlock it, you need to call a number shown on the screen and provide a credit card number. To protect against malicious software such as a virus, Trojan, worm, and a logic bomb, you should use a firewall and keep your virus definitions up to date.